In downtown Saint Paul, Minnesota there is a short picturesque street called Exchange. 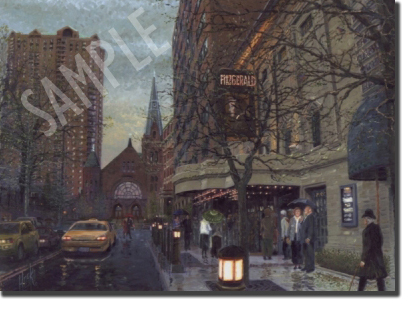 This oil scene depicts a warm and rainy early evening as patrons make their way to the Fitzgerald Theater named after Saint Paul’s famed author F. Scott Fitzgerald. In addition to the numerous live performances it hosts, the theatre is the primary home of Garrison Keillor’s acclaimed radio program A Prairie Home Companion. 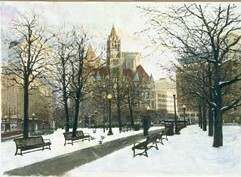 Also depicted from right to left: Central Towers senior residences, the Exchange Building, Central Presbyterian Church, and The Pointe Condominiums.